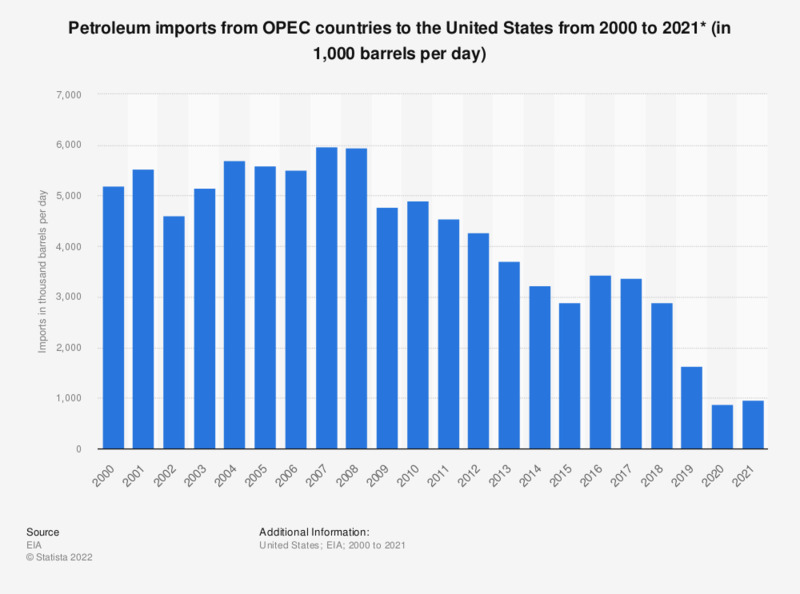 This statistic represents U.S. petroleum imports from OPEC countries between 2000 and 2018. The United States imported an average of 2.89 million barrels of petroleum per day from OPEC* countries in 2018. * On this table, "Total OPEC" includes Algeria, Iran, Iraq, Kuwait, Libya, Nigeria, Saudi Arabia, Venezuela, Qatar, United Arab Emirates, beginning in 2008, also includes Ecuador; beginning in 2007, also includes Angola, for 2000-2008 and 2016, also includes Indonesia; beginning in 2017 also includes Equatorial Guinea, also includes Gabon from 2016, Saudi Arabia includes imports from the Neutral Zone that are reported to U.S. Customs as originating in Saudi Arabia.